Hello, My name is Otis, and this summer I am running in the Midnight Sun Marathon in Tromsø, Norway. This will be my second Marathon, and as I did for my first, I am trying to raise money for a charity local to the area of the race. 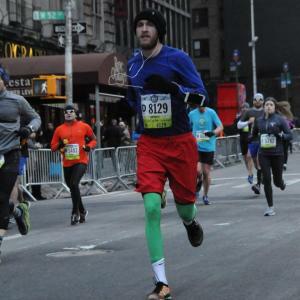 When I ran the New York Marathon I partnered with Robin Hood, an organization focused on alleviating poverty in the New York City Area. For the Midnight Sun race, I thought I would help contribute to the Norwegian Refugee Council. The NRC is a humanitarian non-governmental organization based out of Oslo that works to assist refugees in over 30 countries. They provide food assistance, clean water, shelter, legal aid, and education. They fight in courts and lobby legislative branches across Europe. Today there are over 65 million people fleeing from war, persecution, and areas ruined by climate change. Not since the end of World War II, when the NRC was founded, have so many people been displaced. Last year the NRC aided over 5.4 million people worldwide. It's a terrific organization with an excellent mission. I have requested that all funds contributed to my campaign will be devoted to their work in Syria, one of the greatest humanitarian crises and failures of our time. I appreciate any amount you feel comfortable contributing. Thank you!